5 Great Summer Beach Boardwalks - Top Ten Travel Blog | Our experiences traveling throughout the US. Nothing says summer quite like a lively oceanfront boardwalk. With amusement park rides, walking and biking paths, beautiful coastal views, and plenty of entertainment, you can’t go wrong. Vacationing in a beach town with a great boardwalk gives you so many more opportunities for entertainment, recreation, and photography. Each of the boardwalks listed below are found within fantastic beach towns. Aside from fun filled boardwalks, you will find waterfront resorts, top notch tourist attractions, and great dining and shopping opportunities in each of these great summer vacation cities. 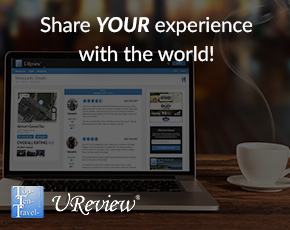 Take a look at the list and be sure to share some of your favorites! Virginia Beach is hands down home to one of the top boardwalks in the country. It’s clean, well-maintained, and lit up at night for enhanced safety. The highlight is a 3 mile long walking and biking path, each conveniently separated for less congestion. The flat route is an absolute breeze, especially with gorgeous coastal views the entire journey. As you stroll or bike along, you will pass several unique attractions including a giant bronze statue of Neptune. Summertime, the boardwalk livens up with free shows and entertainment all season long. On any given day, you will see bikers, runners, walkers, photographers, and tourists out enjoying the beautiful weather. A handful of waterfront hotels and restaurants conveniently line the boardwalk. Stay at a hotel with direct access and great views like the Best Western Oceanfront Plus, Spring Hill Suites by Marriott Virginia Beach Oceanfront, or Residence Inn by Marriott Virginia Beach Oceanfront. Virginia Beach is a great town with lots to do. In addition to the boardwalk, you will find the Virginia Aquarium, First Landing State Park, and Back Bay National Wildlife Refuge more than worthy of a visit. Relaxation, entertainment, and recreation – you have it all in a Virginia Beach vacation. 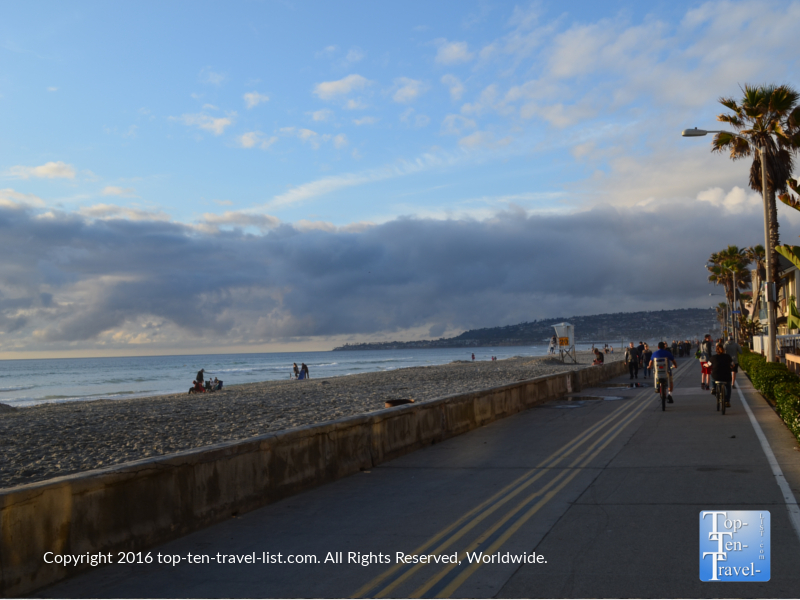 The Mission/Pacific Beach Oceanfront Boardwalk in San Diego is definitely a must-see during your visit to this gorgeous city. A 3 mile shared pedestrian/biking path will give you a tour of 2 of San Diego’s most popular beach cities: Mission and Pacific Beach. Along the way, you’ll take in gorgeous views of the Pacific, enjoy near perfect summer like temperatures, take in the sights of eclectic beachfront homes & vacation rentals, and enjoy endless people watching opportunities. The course is very flat and scenic with never ending views of the water. There is always something to watch, whether it be a volleyball games in action, surfers attempting to catch the perfect wave, or simply tourists and locals enjoying some fun in the sun. The entire boardwalk path including both beach towns is about 3 miles each way, making for a leisurely 6 mile round-trip. Bike it, walk it, skate it, or run it – it doesn’t matter, the views are fabulous no matter the activity. Visit on mornings for fewer crowds, especially if biking as it tends to get a bit congested with the big groups of walkers. A few sights of interest include the Pier at Pacific Beach, the historic Belmont Amusement Park, and waterfront restaurants & bars. In addition to the boardwalk, other must-do activities in the area include a trip to the world-famous San Diego Zoo featuring the Great Panda, a nature walk at Torrey Pines State Reserve, and watching the sea lions at La Jolla Cove beach. Ocean City’s historic wooden boardwalk is often rated amongst the best in the country. The 2.5 mile length is perfect for long strolls or leisurely bike rides. The beautiful coastal views run the entire length. 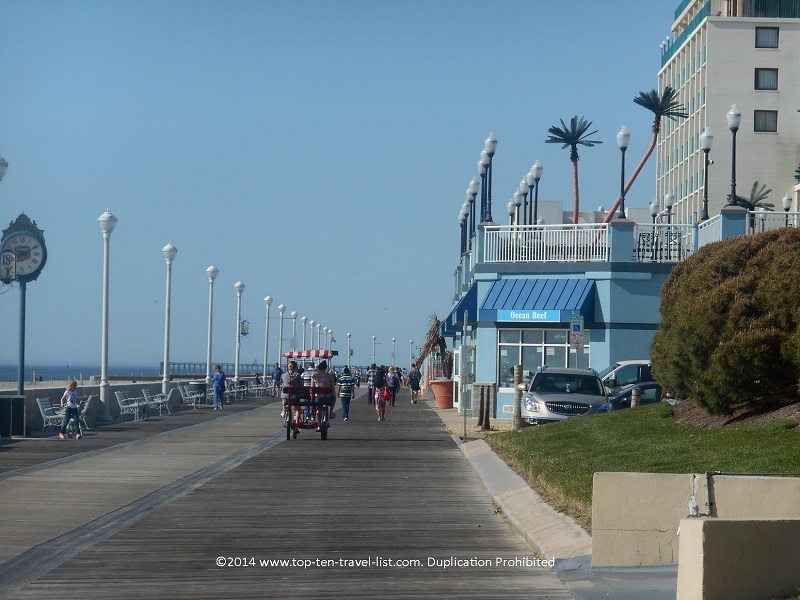 There are numerous attractions along the way including the Ocean City Life-Saving Station Museum, historic Trimper’s Carousel (built in 1912), carnival games, and the Jolly Roger pier amusement park. Treat yourself to some classic fries from Thrashers or pick one of the numerous oceanfront restaurants to dine alongside spectacular scenery. If you want to pick up a souvenir, you will find plenty of shops to do so. During the summer months, you are treated to live entertainment & events such as firework displays, movies on the beach, concerts, and more. There is always something to do whether you are looking to watch a unique street performance or enjoy a summer treat while taking in amazing views of the Atlantic coast. Dozens of hotels are located directly on the boardwalk, most moderately priced. Other activities to check out in Ocean City include cruises, miniature golf courses, Ripley’s Believe It or Not, and various water sports. 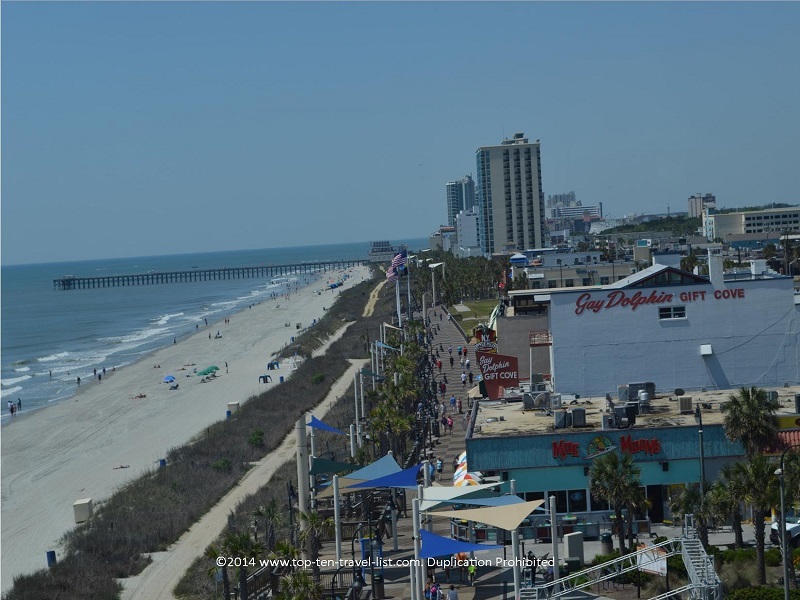 Recently opened in 2010, Myrtle Beach’s gorgeous 6.5 million boardwalk is a must visit for beach lovers. The short 1.2 mile stroll offers beautiful views of the amazing South Carolina coast. Myrtle Beach is part of the Grand Strand, a 60 mile stretch of uninterrupted beaches along the coast of South Carolina. 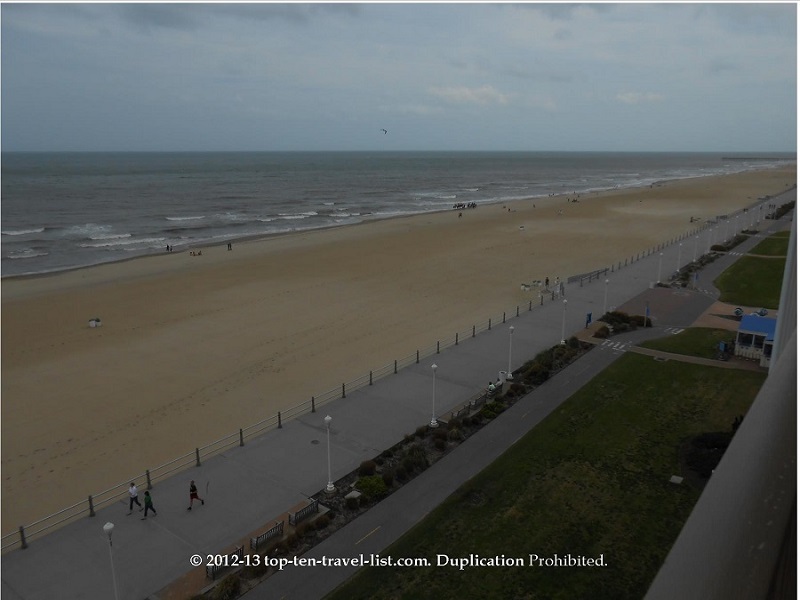 The boardwalk is clean, maintained, and nicely landscaped. The summer evenings are filled with all different types of entertainment including concerts and fireworks shows. There are a handful of restaurants and souvenir shops, but not too many, so it maintains a nice non congested feel. The 2 main attractions are the SkyWheel, one of the largest Ferris Wheels in the country and Pier 14, a restaurant and fishing/sightseeing pier. The 187 foot tall Ferris Wheel is the shining star of the boardwalk, providing some of the best views you will ever experience of the coast. From the air conditioned enclosed gondola chairs, you will be treated to breathtaking views of the Atlantic. Some tourist attractions are not worth it – the SkyWheel, on the other hand, is definitely worth the small admission fee! Don’t miss out on this one! For just a buck, you can walk out onto Pier 14 and take in the beautiful sights around you. This is a beautiful location for photography, both of the beaches and boardwalk. Also plan an evening visit to take in the views of the SkyWheel lit up at night. In addition, the pier is a hotspot for fishing and equipment can be rented. Great oceanfront lodging choices include: Bay View Resort, Island Vista Resort, and Anderson Ocean Club. 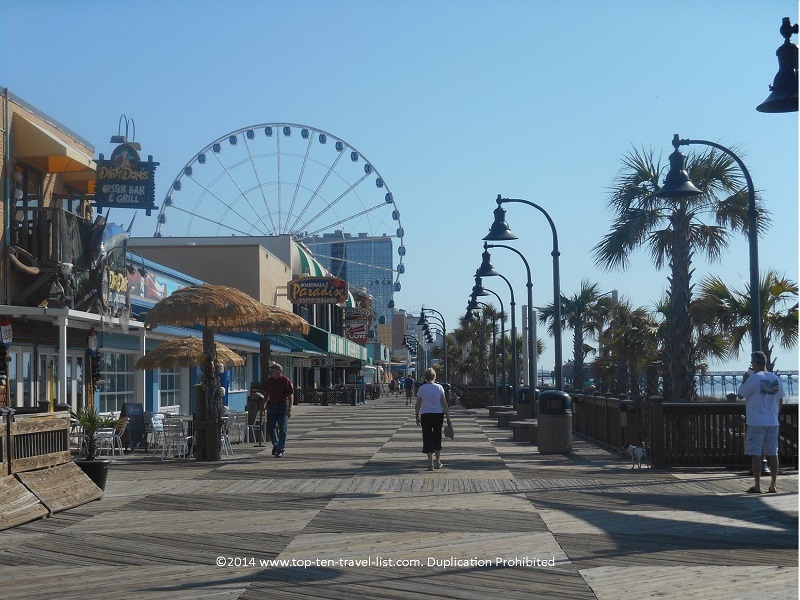 Myrtle Beach is a great beach town with plenty of attractions outside of the boardwalk. A few of the top sights to see while in town include Myrtle Beach State Park, The Carolina Opry, Broadway at the Beach (a dining, shopping, & entertainment complex), Ripley’s Aquarium, mini golf courses, cruises, watersports, and dozens of shows. 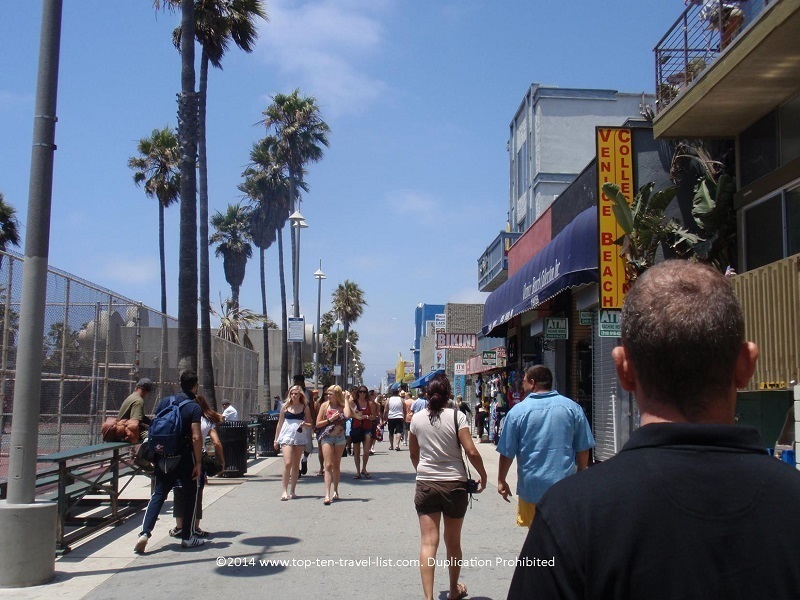 Venice Beach is the most interesting of all the boardwalks, and well known due to its’ presence in the media. Along this eclectic boardwalk, you will be able to take in interesting street performances, browse all different sorts of crazy tourist shops, and try out diverse treats at the food stands. This is definitely a people watching paradise. You will never see so many weird sights again after a visit to Venice Beach. Jugglers, glass walkers, fortune tellers, tattoo artists, magicians…you will find it all here! Venice Beach is surrounded by other great beach towns like Manhattan Beach and Santa Monica. The Santa Monica Pier is another must visit on your trip. Here, you can ride a roller-coaster while taking in gorgeous panoramic views of the Pacific! Also be sure to check out The Strand, a 22 mile bike ride stretching from Torrance to Pacific Palisades. A portion of the path rides right pass the Venice Beach boardwalk, thus making a bike ride the most fun & easiest way to get to Venice. 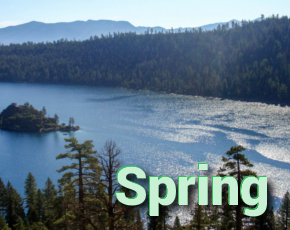 Los Angeles is filled with interesting attractions, both recreational and cultural. Be sure to check out the Griffith Observatory, Universal Studios, The Getty Center, Runyon Canyon park, and of course all the gorgeous beaches! There are plenty of budget and luxury hotel options in the area. The Inn at Venice Beach and Venice on the Beach Hotel are 2 moderately priced options in the area. If you want something a bit fancier, you can check out Shutters on the Beach in Santa Monica or the Four Seasons Hotel Los Angeles at Beverly Hills. Have you visited any of these boardwalks? What are some of your favorite beach cities?